With potential big money moves for continental players such as Mathieu Debuchy and Luuk de Jong being lined up, we take a look at the players closer to home that may have caught the eye of Toon boss Alan Pardew. 5. Josh Morris – The first player on this list is a player that Newcastle haven’t even been linked with, but could be a target in the near future. Upon relegation from the Premier League, there have been rumours that Blackburn Rovers are prepared to let a host of youngsters leave the club, with left sided player Josh Morris supposedly on the way out of Ewood Park. Morris made a handful of impressive substitute appearances for Rovers, before being loaned out to Yeovil Town for the remainder of the 2011/12 season. With the 20 year old being able to play at left-back or on the left-wing, he is very similar to Newcastle’s own Shane Ferguson, so it would be very interesting to see whether or not a move is made for this player. 4. Luke James – Among the players that Newcastle have officially bid for is 17 year old Luke James of Hartlepool United. Despite only making 12 starts as a professional footballer, he has shown immense talent for a player of his age; more than enough for Alan Pardew to submit a formal offer for the player. If this transfer goes through, then Newcastle will have one heck of a talent on their hands, but there is reported competition from Bolton Wanderers and Celtic (and probably Liverpool, once they see that Newcastle are interested…) for his signature. 3. 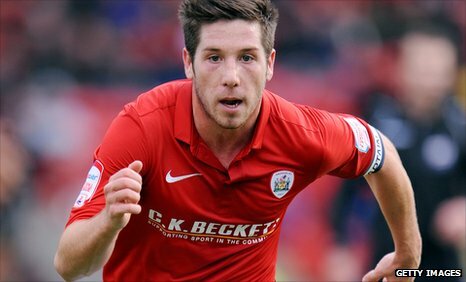 Jacob Butterfield – Another player who Newcastle are known to be very keen on securing is Barnsley midfielder Jacob Butterfield. Bradford born Butterfield broke into the Barnsley first team aged just 17, and hasn’t looked back since. Ironically, that debut game was against Newcastle in a League Cup tie (a match Newcastle won 2-0 through goals from Michael Owen and Obafemi Martins). Butterfield impressed immensely in his breakthrough matches, and became a constant figure in Barnsley’s first XI. His 2011/12 season was unfortunately ended prematurely following a horrific injury suffered against Leeds, but his reputation remains as one of the best prospects in The nPower Championship. 2. Jordan Rhodes – One player which almost every Premier League seems interested in is Huddersfield’s Scotland international striker Jordan Rhodes. After scoring a ridiculous 47 goals in all competitions for club and country last season, Rhodes has put himself on the radar big time for this summer. Despite the huge interest in the player, Newcastle have made official approaches for the player in the past, so we know there is some genuine Newcastle intent. 1. Nathaniel Clyne – The biggest and most known English target of Newcastle is Crystal Palace fullback Nathaniel Clyne . With Danny Simpson almost now certain to leave The Sports Direct Arena, the Newcastle hierarchy seem to have demanded a minimum of two right-backs in order to cover for the squad demands of the tough Europa League schedule. The Newcastle Journal has reported that Newcastle have officially opened talks with Crystal Palace to agree a fee for the player, despite the fact that his contract ends on June 30th.